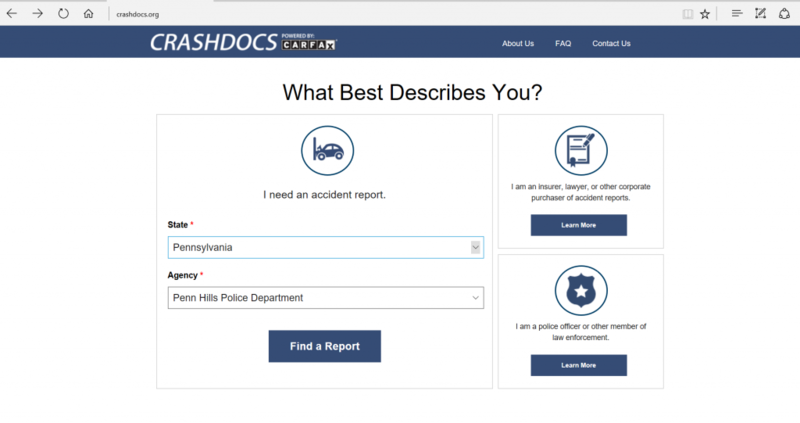 The Penn Hills Police Department, in partnership with CRASHDOCS.org by CARFAX, now allows you to purchase accident reports online, without having to visit the Records Division during their regular business hours. The fee remains $15.00 for each report you wish to purchase. Simply visit the CRASHDOCS website, search for your report, pay and then print it from the convenience of your own home. Your insurance provider will also be able to use this service to obtain the report. If you’ve had the unfortunate experience of being involved in a crash, whether it’s considered “reportable” or “non-reportable” (minor accidents not involving injuries or disabling damage to vehicles), and a Penn Hills police officer responded to take a report, then you will be able to access that report online. Reports purchased from CRASHDOCS contain the same information as the ones obtained from the Records Division. Please allow five to seven business days for your report to be uploaded to the CRASHDOCS website. You will need the last name of the driver or an involved party, date of the crash and the incident number to search for the report. The officer handling the investigation will provide you with the incident number. Our goal through this partnership is to simplify your experience when dealing with the frustrating and time-consuming process that often follows a vehicle accident. Skip a step and save yourself the trip to the police department. Have your report in minutes, when it’s convenient for you!